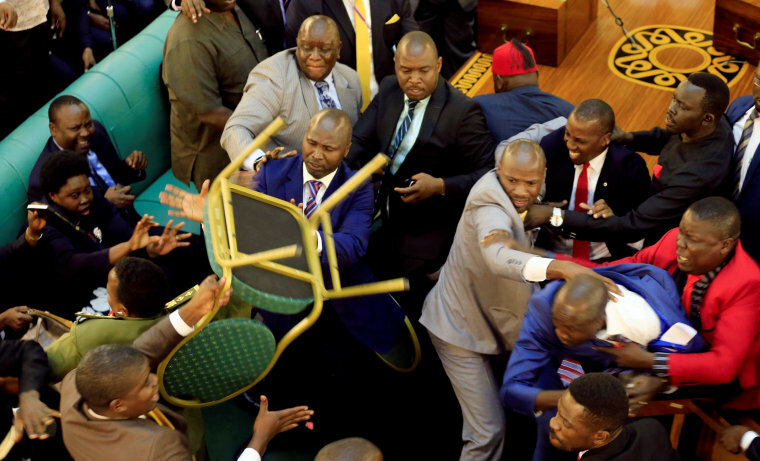 KAMPALA — Fistfights and chair-throwing broke out in Uganda's parliament on Tuesday ahead of a debate on whether to grant long-serving President Yoweri Museveni another term in office. The move to extend his rule has met widespread opposition from civic rights activists, the political opposition, religious leaders and even some members of Museveni's own ruling party. He has been in power for more than three decades. Local television showed government and opposition lawmakers coming to blows after the House speaker allowed a ruling party legislator to introduce a motion to kick-start the process to remove an age cap from Uganda's constitution to allow Museveni to run for re-election. "Please take your seats... Let us speak with our words, not with our fists," Parliament Speaker Rebecca Kadaga said as she tried to calm the enraged lawmakers. Toward the end of a nearly six-hour session, moments before the controversial motion was read, legislators opposed to it successfully foiled its introduction by breaking into endless singing of the national anthem. After repeated calls of "order, order, honorable members" by Kadaga failed to silence the MPs, she adjourned the session. Under the existing constitution, a person standing for president must be under 75 years of age -- which would make Museveni, 73, ineligible to stand at the next polls in 2021. Before Tuesday's parliamentary sitting got under way around, police fired tear gas to disperse protests by students and other opposition activists in the capital Kampala, police spokesman Emirian Kayima said. "Some students and other young people were causing commotion and attempting to rob shopkeepers. We engaged them with teargas," Kayima said. Nineteen people including Uganda's leading opposition figure, Kizza Besigye, were also arrested. Kayima said Besigye was taken into custody after he attempted to mobilize protesters to march on parliament. In recent years however, rampant human rights violations, corruption and broken public services have fueled opposition to his rule. "The military siege around parliament - it's the end of people power in Uganda, it's a full-blown military dictatorship," said Sarah Birete, program director at the Kampala-based Centre for Constitutional Governance.